I have never, and I mean never, met a beef stew that I couldn’t make friends with. When it comes to beef stew I am basically just a girl who can’t say no…but I do have certain requirements. And my biggest one? NO POTATOES. Nope. I love potatoes in many scenarios, but not in my beef stew…they get too soggy, and even if you put them in towards the end of the cooking process, they just take up too much room. Nope, I like my beef stew carbs in other ways…in this case, via some crispy breadcrumbs on the top and some creamy polenta on the bottom. Mmmmmm. The overall recipe is classic beef stew – beef chuck cubes seared and then cooked with a conglomeration of carrots and leeks and other goodies until it is tender and perfect. Usually beed stew cooks on low, but I like this one cooked on high…this particular one seems to come out better that way. When it is done, whisk a little flour in to thicken up the sauce. In the meantime, you want to be making a potful of creamy polenta (and as always, I think Anson Mills makes the best polenta in the universe) and toasting up a handful of fresh breadcrumbs. Whatever you do, I am begging you not to skip the breadcrumb part. It seems like such a little thing, but they add the perfect, perfect finishing touch of crunchy deliciousness. Now all that is left to do is ladle a nice puddle of polenta on to each plate, scoop out some beef stew on top, scatter on some breadcrumbs and parsley and serve it up. Warm and wonderful and just right for the shivery days of January. Happy beef stew! 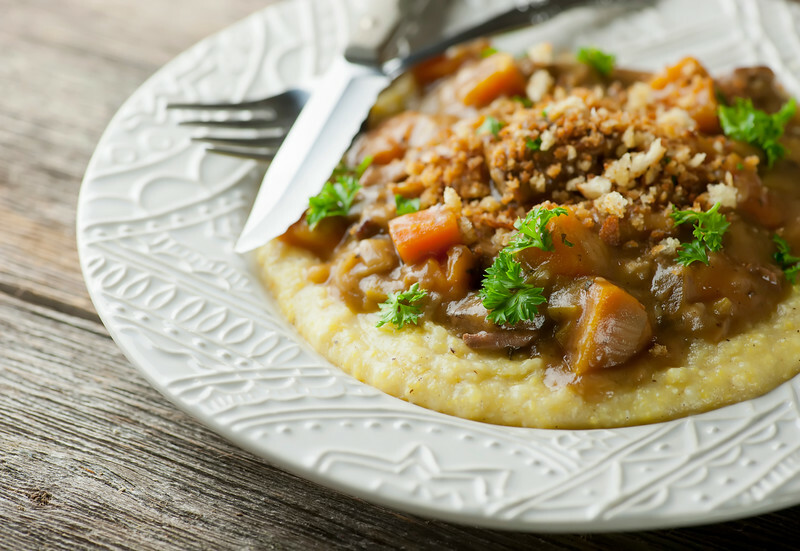 This recipe for warm and wonderful beef stew skips the potatoes in favor of creamy polenta and crispy breadcrumbs! Heat 2 tablespoons of olive oil in a heavy skillet and sear the beef cubes on all sides. Add beef to slow cooker with 3 tablespoons flour, broth, tomato paste, thyme and allspice. Cook on high setting for one hour. Add carrots and leek and cook for another 6 hours on high or until beef is tender. Whisk in flour (I like to shake it in through a small fine mesh strainer to avoid any lumps) and cook for another 5-10 minutes to thicken the sauce. While the sauce is thickening, make the breadcrumbs by heating a tablespoon of olive oil in a skillet over medium high heat. Add breadcrumbs and stir until brown and crispy. Taste and season stew with salt and pepper. Ladle polenta into warmed bowls, top with stew and garnish with breadcrumbs and parsley. Serve at once. This stew recipe sounds delicious! I am a big fan of stew over polenta and is the way I usually serve my stew. I don’t think my husband would be happy with his stew without potatoes but I may just make this one. If he misses his potatoes, I’ll just add them next time! Hey polenta is a great idea!